These herbs are traditionally used to enhance digestion, remove food stagnation, resolve accumulations of phlegm and moisture, and provide a slight laxative action. The combination includes the four primary therapeutic actions relied upon by Chinese doctors to promote weight loss and reduce blood lipids. Malt, (barley sprout), shen-chu (fermented wheat with artemisia herb), crataegus (hawthorn fruit), raphanus (radish seed), citrus peel, and pogostemon (patchouli herb) invigorate the digestion of foods in the stomach; hoelen mushroom, phaseolus (red bean), alisma (water plantain rhizome), citrus, and pogostemon remove excess fluid; cassia (senna seed) and pharbitis (morning glory seed) provide a laxative effect. Crataegus, alisma, and cassia reduce blood lipids. The combination of malt, shen-chu, crataegus, and raphanus was shown, in a clinical trial, to alleviate symptoms of abdominal distention, intestinal gurgling, eructation, acid regurgitation, and intestinal cramping in patients with sluggish bowel function. The recommended dosage for Bojenmi Tea is 3-6 grams each time (one tea bag contains 3 grams), to be taken three times daily, thus 9-18 grams of the tea leaves carrying the herbal extracts is taken in one day (3-6 tea bags). According to the package information, if no dietary changes are made, one can still lose weight, though it is best to have a low calorie diet for continued weight loss. 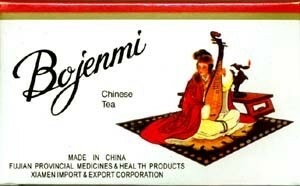 Bojenmi tea has a mild taste, something like ordinary black tea, with a slight added spicy-bitter taste. A small amount of sugar (or other sweetener) can be added to alter the taste, if desired. A story about the value of ordinary green tea in removing fat was told this way: "In the Chinese restaurants, to clean up the spilled greasy food left after a meal, some of the remaining tea is poured onto the table top and then the grease dissolves and is easily cleaned up." Chinese physicians point out also that alisma counteracts the "greasy quality" of herbs; because of this property, it was thought to reduce excess grease (fat) in the body, which has since been found to be true, based on laboratory and clinical evaluations. Baojenmi Tea is a derivative of the traditional formula Baohe Wan(maintain harmony pill) a prescription of Zhu Danxi, originally recorded in Danxi Xinfa(The Fundamental Methods of Zhu Danxi; 1481 A.D.) This formula, available also as a patent remedy, contains the following ingredients in common with Baojenmi Tea: crataegus, shen-chu, raphanus, citrus, hoelen, and malt. The traditional formula was indicated for treating stagnant food, eructation, diarrhea, and thick coating on the tongue, indicating the phlegm excess resulting from food stagnation related to overeating. Bojenmi Tea treats the same conditions as Baohe Wan. It contains a small amount of mild laxatives, so that it can treat constipation, but it will still alleviate diarrhea that occurs from overeating and impaired digestive functions. In addition to rectifying the digestive disturbance that leads to accumulation of fat and water with resulting weight gain, it also helps conduct out excess fats from the blood. Baojenmi Tea has its origins in the coastal island city of Xiamen, known as Egret Island, because of the many egrets that used to reside there; the river is called Egret River, inspiring the brand name for this product. Xiamen is also known as the Garden of the Sea and the Green Island, because of its luxuriant plant life.